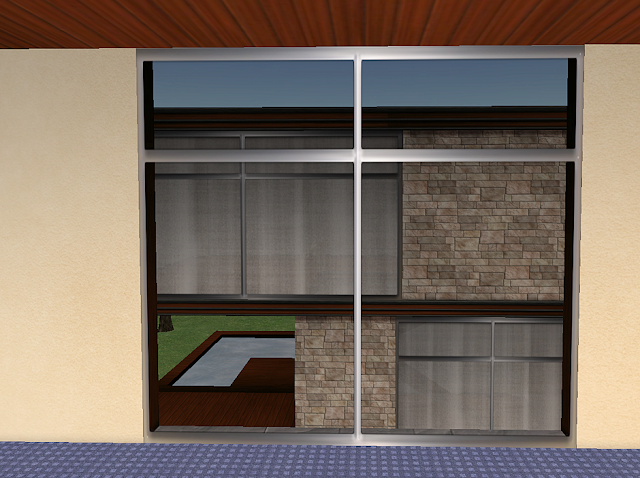 It’s easy to add One Way or Tinted Glass Windows to Your Linden™ Home or other Second Life or OpenSim House. This article will show you how, step-by-step. This is a simple project easy enough for a beginner. Second Life window with standard glass. Not much privacy for the house in the image above. But then privacy isn’t something you should expect much of in Second Life. Even so, it would be nice to not have it this easy to see inside! Unlike the real world, creating a one-way glass window in Second Life® is easy, even on a pre-fab Linden Home. This window is tinted or completely transparent from the inside so you can see out, but it is completely opaque from the outside. Nobody can see in, even at night with the lights on! The opaque side of the window doesn’t even need to look like glass, it can have any color or texture you desire. 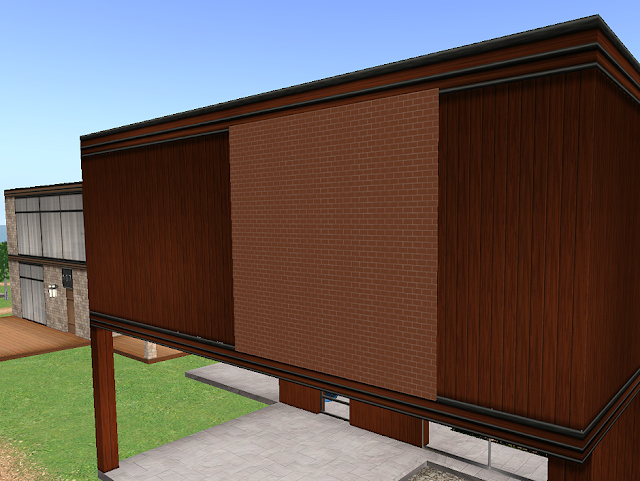 One of the great things about building in Second Life is that many of the constraints of the real world don’t apply. You can create a building where the windows viewed from the outside are in totally different locations than those on the inside! If you have a pre-built home like a Linden Home™ or a packaged home you bought, you probably can’t replace the existing windows. But you can still easily tint them or make them one-way glass. 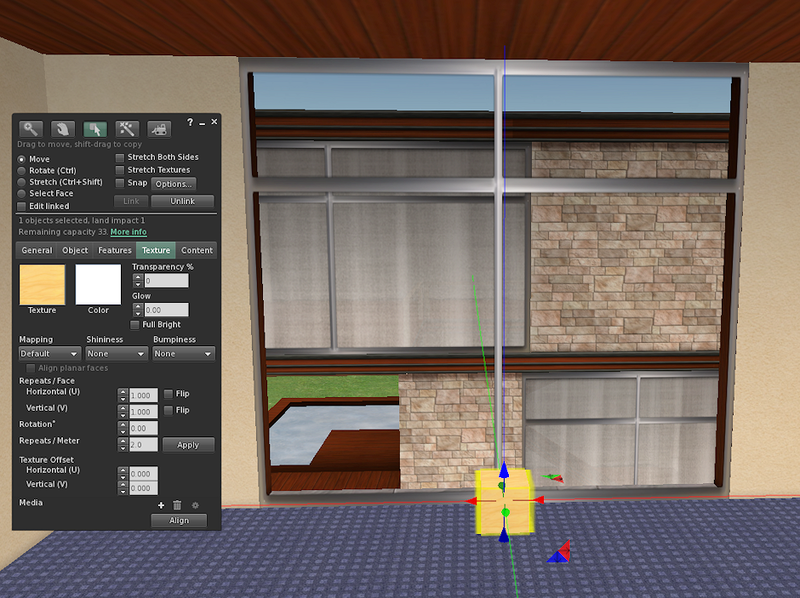 All you do is create a second piece of glass with the tint or one-way feature, then place it over the existing window. The existing window will take on the characteristics of the new “glass”. 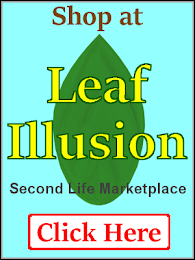 Further down this page are complete instructions on how to add one way glass windows yourself. 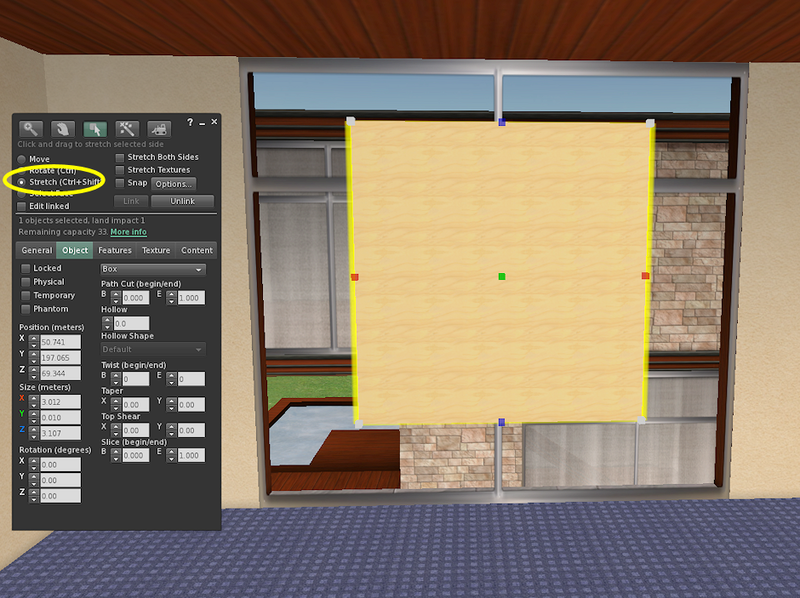 Download my one-way glass panel collection in-world. Don’t want to take the time and effort to make your own panels? You can grab a whole set of various color and tint combinations in-world. There are 42 one-way glass panels in the package, utilizing a combination of 6 exterior opaque colors, and 7 interior tints. Take a look at this page for all the combinations. Warning for Linden Homes and some others as well. Linden Homes typically have the house walls placed right next to the property line. So if you create a one-way glass panel and push it too far toward the outside of the window it will go over the property line onto someone else’ property. In the case of Linden Homes this is almost always Protected Property. If you place the glass panel the parcel line chances are it will be taken away from you. (It will usually be returned to your Lost & Found inventory folder sometime within 24 hours.) This can be a real pain, so be careful when placing your one-way glass panel that it doesn’t go off your property. 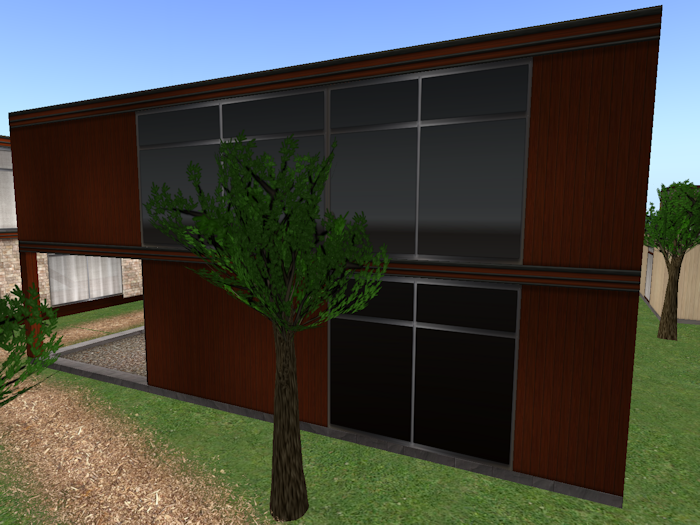 SL Trick: Faking a Prim Location in Relation to a Property Line. 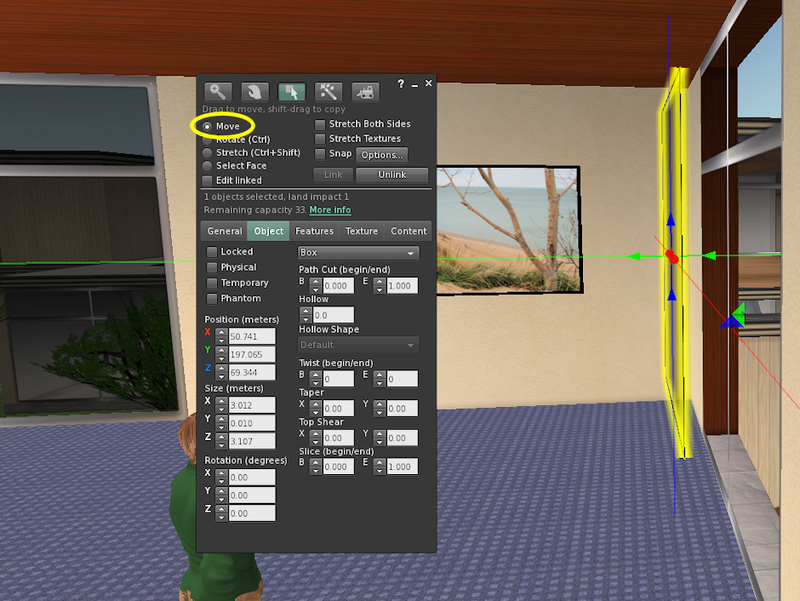 The servers that run Second Life’s sims see the official location of an object based on the center point of the object. This allows for a trick when it comes to property lines. As long as the center of an object (prim), like your glass panel, is on your property, the server will think that all of the panel is on your property! So if part of the panel extends off of your property, it will not be taken as long as the center of the panel is on your property. Thus by making the panel thicker you can actually shove part of it a little ways over the property line. (You can also attach a second transparent prim to the panel, the server sees the location based on the center of the last prim added to a multi-prim object.) Most neighbors don’t mind your encroaching a short distance over the property line if it doesn’t interfere with their use of the property. However be careful, if you abuse this you can be reported and disciplined for violating your neighbor’s property rights. Tip: Use the photo captions as a quick guide if you are experienced with building things in SL! Rez a standard cube onto the floor. From top menu select Build > Build. Or press Ctrl+B. 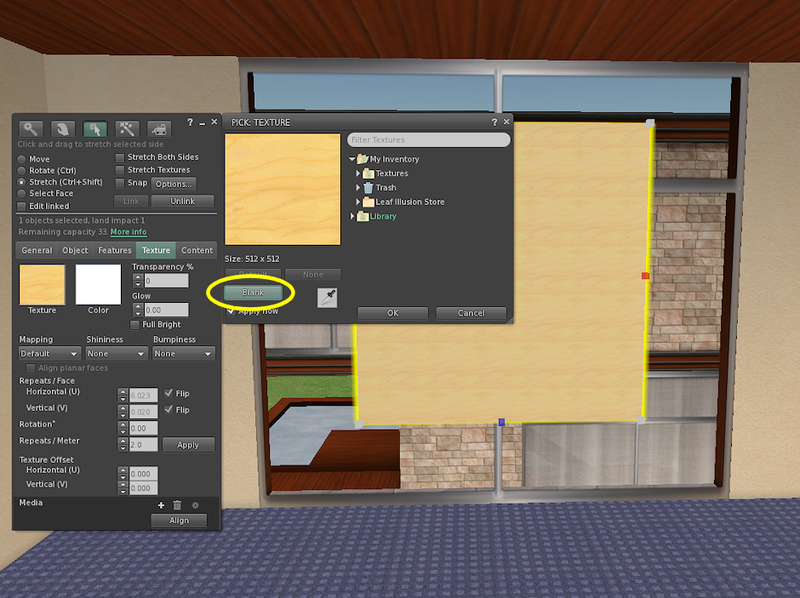 Click on floor to create a standard default “plywood box”. Optional: This is a good time to name your object. Click on the “General” tab and enter a name like “1-way glass”. If you ever have to edit the glass this will make it much easier to tell if you have selected the correct object for editing. When there are a lot of other objects in the vicinity it can be hard to figure out which one you selected. Move the cube up to about the middle of the window. Use the arrows to drag the box up centered on the inside of the window. Change the thickness of the cube to 0.01m to create a flat panel. Select “Object” tab, change the box thickness to 0.01m. Now it should be shaped like a glass panel rather than a cube. Stretch out the panel to cover about 2/3 of the window area. Drag the red, blue, or green squares to stretch the panel so that it covers much but not all of the window. I’ve found it is easier if you don’t cover the whole window with the new panel at this point. However that is just my personal preference. You can stretch the panel to any size you like! Set the Texture to “Blank”. 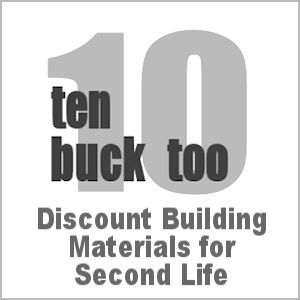 Click on the plywood color square with Texture written below it. The Pick Texture window will open. Set Shininess to Low and the color to Black. Set Transparency to 0 and Glow to 0.00. Set Shininess to Low. If you set it to Moderate or High the glass will look more reflective, but also will become appear more gray than black. This is a personal preference, you may like the grayer but shinier look. Click on the white square with “Color” written below it. The Color Picker window will open. Click on the black color swatch to select true black as the color. 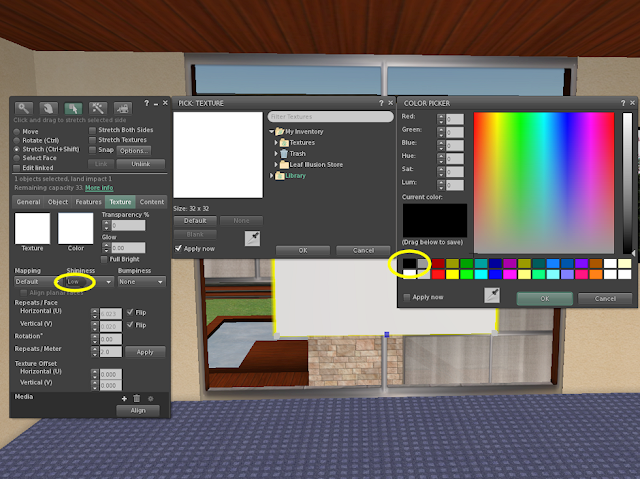 Close the Color Picker and Pick Texture windows by clicking “OK” for each. Tip: You don't need to use black. Change the color to any other color you wish. The color you pick will be the color of the window when seen from outside. Select the “Select Face” button. 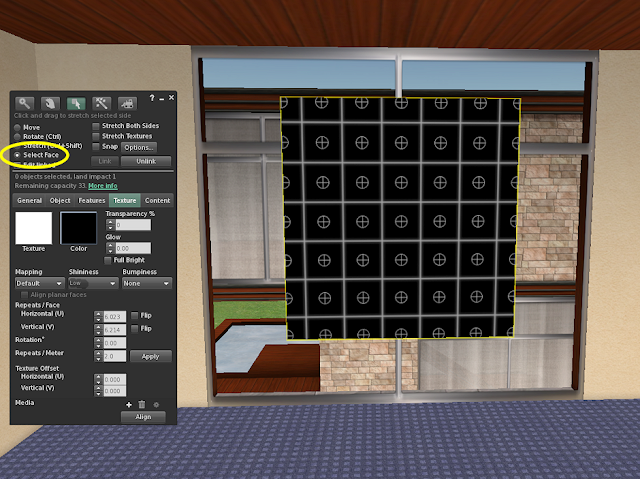 Click on the side of the panel facing the inside of the room. Selecting a face allows you to make changes only to the side of the panel you selected. 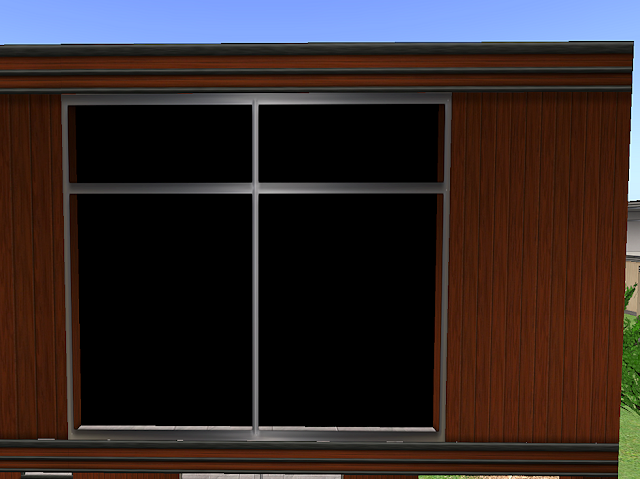 This will allow you to change the inside of the panel to be transparent so that you can see out, while the opposite side of the panel will remain opaque black, so nobody can see in. Set the transparency to 50%, or any degree of tint you like. Change the transparency to 50%. 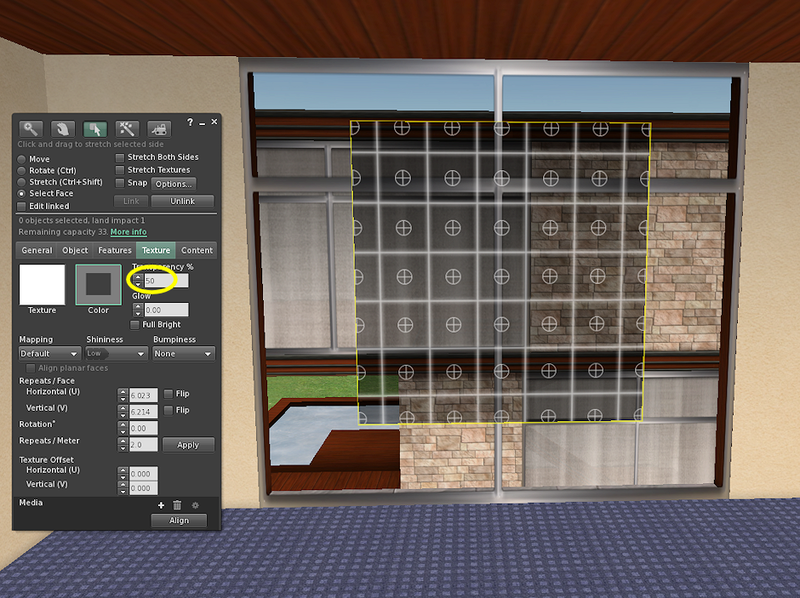 You can adjust the transparency value up or down for the amount of tint you want, darker or lighter. You can change the color if you like also, this will be the tint color as seen from the inside. Rotate your camera to the side. Move the panel up against the window and stretch the sides so that it covers the entire window. Stretch the edges of the panel so that they extend into the wall and the panel covers the entire window area. From inside the home it now looks like a tinted window. The tint gives a feeling of more privacy. From outside it is black & appears reflective, you can’t see in. This bricked in window looks like a normal transparent window from the inside. No it's not pretty from the outside, but it makes the point. 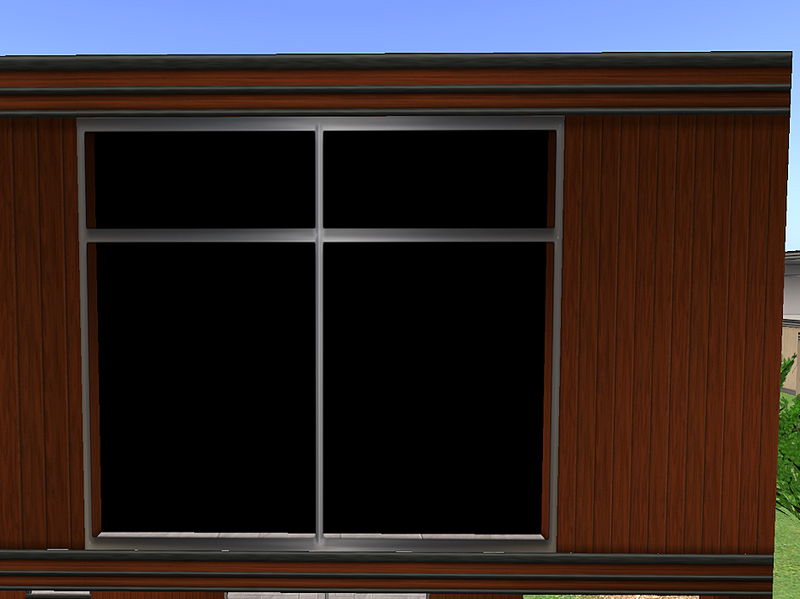 You can use any texture you want on the outside, and it is still transparent from inside! Optional: You can use any texture for the outside side of the glass panel. For example in your inventory selecting the texture Library > Textures > Buildings > Brick will make the window look like it has been bricked in using red bricks! Or you could use a wood pattern to make it looked boarded up like an abandoned house. When using textures like this I suggest you change the panel thickness, perhaps from 0.01m to 0.10 m. The extra thickness help cover the window from the outside and also help keep the center of the panel on your property. 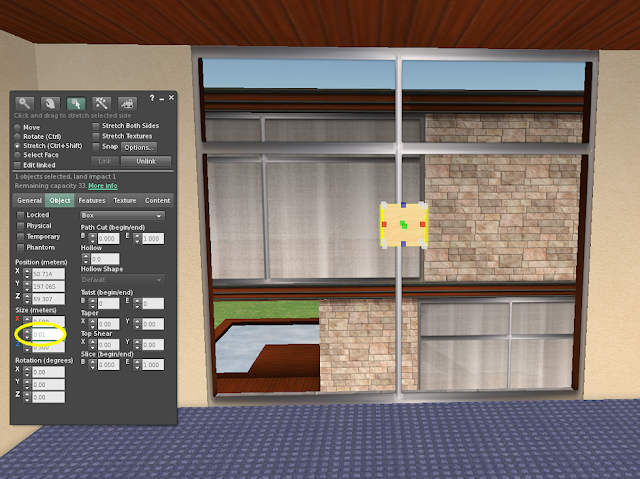 If you want to play with textures I suggest that first you get the one-way glass setup using the basic tinted glass instructions. Then make a copy of your panel and experiment on it. 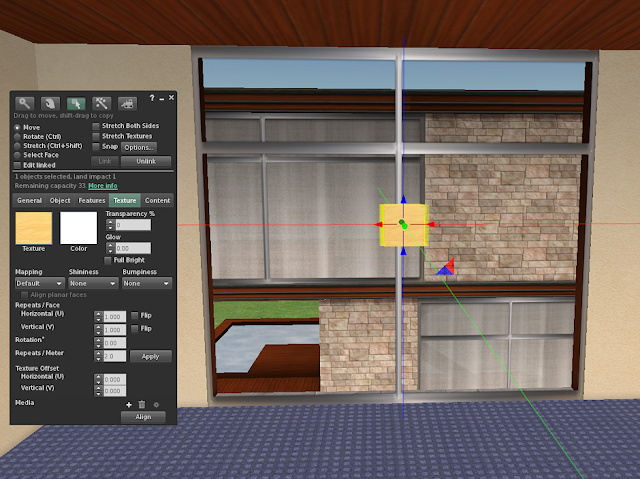 If you have trouble selecting the one-way glass panel after making it transparent, press Ctrl+Alt+T to highlight the transparent objects making them visible and easier to select. The transparent window will be highlighted red, along with anything else in the vicinity that has transparent parts (like most avatar’s hair!) Press Ctrl+Alt+T again to remove the highlighting. Try to get the camera between the window and the panel if you can. It is easier to select the one-way glass pane if you can get your camera right up against it.